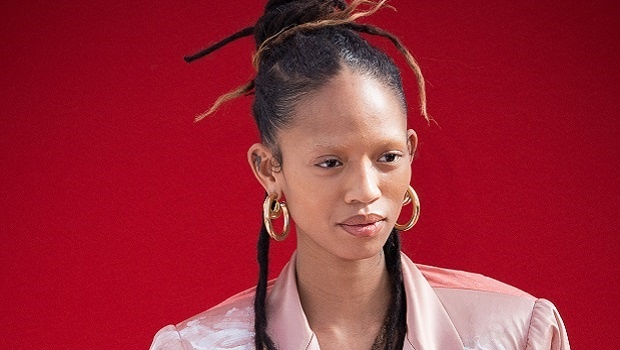 Outspoken and fierce as a razor sharp clapback, this model speaks to something crucial (and forever lacking) in the modelling world - being unapologetically yourself, no matter the consequence. I first spotted Adesuwa Aighewi when I was browsing pictures of Vivienne Westwood's recent Paris Fashion Week arrivals and front row. Designers really only invite super cool influencers to sit front row (they change almost every year), so I knew she must be a big deal. Turns out she's a force to be reckoned with, as she works her way into the mainstream. Of Nigerian, Chinese and Thai descent, Fashionista.com notes that she's unapologetically outspoken. Be it on Twitter or IRL. The Guardian has also written about this beauty, particularly about her locs. Last year, just ahead of New York Fashion Week she opted for a new 'do. Dreadlocks. Her agency warned her that this would hamper her chances of getting big jobs as many designers see the look as 'too black'. But Adesuwa ignored them and decided to keep the look. Then, to her agency's surprise she got booked to open for Coach's Pre-Fall 2018 show. Coach, known as a pretty conservative brand, wanted her just as she is. Her unapologetic approach also extends to her style. She told Fashionista.com that her brand of style is what she and her friends call 'Grandmathot'. 'Thot' which is slang for t(hat) h(o) o(ver) t(here), is a contentious term. But one that she seems to embrace. Think of her style as mix of provocative granny chic. Staying true to herself despite being excluded by some designers, is an act of resistance that is so necessary. Changing what is conventional needs constant challenging from people who are considered unconventional, which is why voices like hers, speaking by means of her hair or look is so important for change and inclusive representation.